Pupils at Milne’s Primary School get tour of £2million extension, which has been completed in time for last day of term. Pictured: Hannah Stewart-Sutherland P7, Sonya Warren, chairwoman of Moray Council's children and young people services commitee, council convener Shona Morrison, P7 pupil Tavis Thomson. School pupils in Moray have been given their first look inside their new £2million extension. The five-classroom building has been built at Milne’s Primary School in Fochabers to replace temporary huts which had been used until now. Yesterday, primary 7 students Hannah Stewart-Sutherland and Tavis Thomson cut the ribbon to usher in a new era for the village on their last day at the school. The extension, which will include nursery space, will welcome its first pupils after the summer holidays. The previous schoolhouse, which was built in the 1930s, was bulldozed in order to make way for the new buildings. In its place, a garden has been created to create outdoor learning opportunities on the grass and timber decking. 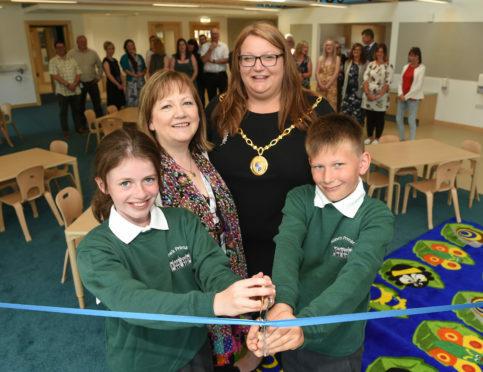 Moray Council convener Shona Morrison, who is a former chairwoman of the school’s parent council, described the opening as an “emotional day”. She said: “My two daughters both went through the hutted accommodation. The youngest is now 14, which shows how many years this has been talked about. “The former head teacher really pushed very hard for this and it’s very emotional to see it all come to fruition now. Energy-efficient features have been incorporated into the design to reduce the building’s impact on the environment – including solar panels, under-floor heating and lights that automatically change setting with the daylight. The project, which was equally funded by the council and the Scottish Government, will allow all 200 of the school’s pupils and 20 nursery children to be taught in the same building. Attention will now turn to phase two of the project, which will involve demolishing the existing nursery to make way for an outdoor amphitheatre and play area. Stuart Parker, managing director of contractors Morgan Sindall in Scotland, explained that blending the 21st century design with the main school building, which dates back to 1846, was a complex task.